I find neutral colours really soothing, especially at Christmas when they create an elegant contrast to all the reds and greens. I will always love traditional Christmas colours but every so often I find my eyes need a rest! The 5.5" square card is made from Crumb Cake cardstock. I do like this size because I can get a nice square card from a piece of A4 cardstock. I added a layer of Very Vanilla, then Copper Foil Sheet followed by a piece of Candy Cane Lane DSP. Since I love the Copper Foil so much and know I'll be using a lot of it - I decided to employ a little trick to stretch it as far as possible. I removed the centre of the square before adhering the decorative paper to the top. I cut the pine branches in Garden Green and Wild Wasabi cardstock and layered them onto the top of the card using the Fine-Tip Glue Pen. I used the glue towards the bottom end of the sprigs, leaving the top ends free to add some dimension to the card. I cut one of the pine cones from Copper Foil Sheet and adhered it under some of the branches. I cut the Merry Tag with Very Vanilla cardstock and also in Garden Green. 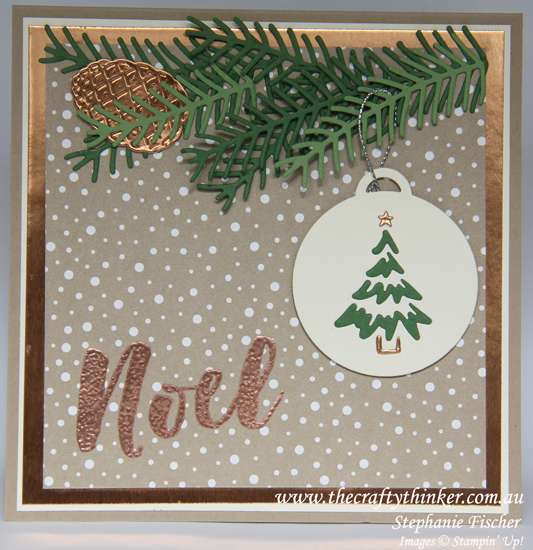 I used oddments of the Copper Foil (strategically placed under the die) to cut the star and the base. Using the Layering Circles dies, I cut a circle of cardstock just a little smaller than the tag and adhered them together. I then used the Fine-Tip Glue Pen to insert and adhere the green and copper elements of the tree design. I placed Stampin' Dimensionals on the back of the tag. I looped some cord around one of the branches and adhered it to the back of the tag before sticking the tag to the card front. I haven't yet purchased the Baker's Twine Trio Pack (but it's high on my wish list!) so I had to use a retired silver cord on this card.